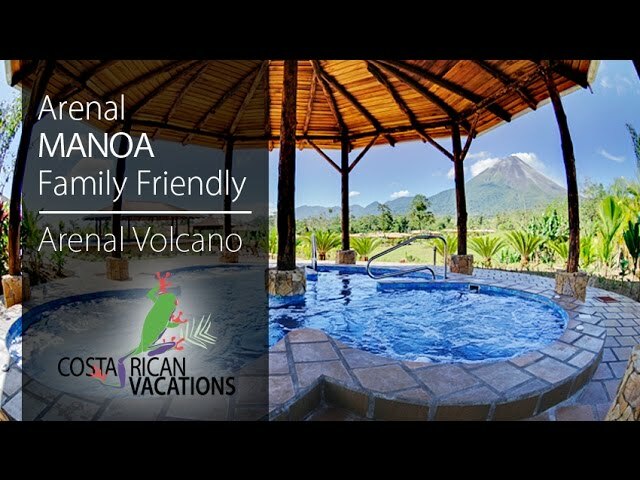 Family Friendly Hotel, Great Value, & Great Views of the Volcano! Just outside of the small town of La Fortuna sits the charming Arenal Manoa Hotel. The Arenal Manoa is a large, service-oriented property, with various amenities like two swimming pools each with spring-fed Jacuzzi, spa, and small farm on site, making it a great choice for families with young children or couples looking for value and comfort on their vacation to Costa Rica. The Arenal Manoa’s rooms are set among well-manicured gardens, each with its own patio and rocking chairs for relaxing afternoons admiring the views of the Arenal Volcano. All suites are equipped with modern amenities while maintaining the rustic charms of a mountain resort. Guest rooms come with A/C, satellite TV, safe deposit box, hair dryer, and coffeemaker. In addition to standard suites, the hotel offers both Superior and Honeymoon suites, each with additional amenities. The Honeymoon suites feature Jacuzzi-style hot tubs. Guests can enjoy traditional Costa Rican and international dishes at the hotel’s main restaurant, the La Saca Restaurant. La Saca serves a breakfast buffet and offers an a la carte menu for lunch and dinner. By the family pool, guests can swim up to the Güipipia Bar for snacks, beverages, and cocktails. At the lounging pool, the Uyuyui Bar offers the same menu of light fare and beverages. Buffet breakfast is included each day at the Arenal Manoa. Guests can arrange a complimentary tour of the property’s farm, great fun for young children. Spacious rooms give guests the opportunity to lie in bed while taking in the stunning panoramic views of the volcano and surrounding forest. Manoa’s restaurant satisfies your culinary desires with a wide range of exquisite international and local delicacies, accompanied with some of the best wine found in Arenal. The pool and Jacuzzi area benefits from a wet bar and beautiful view of the volcano so you can enjoy the sights and sounds while relaxing with the drink of your choice. Manoa offers massage sessions from the comfort of your own room. Complimentary WiFi in the rooms and lobby. Earned Level 3 CST (Certificate in Sustainable Tourism) through the Costa Rican Tourism Board.